I’m a makeup geek. While the topic is of makeup is a somewhat sensitive topic among some geek ladies, I embrace it with no reservations. I’ve always loved makeup–not just the application, but the history and the science behind it. 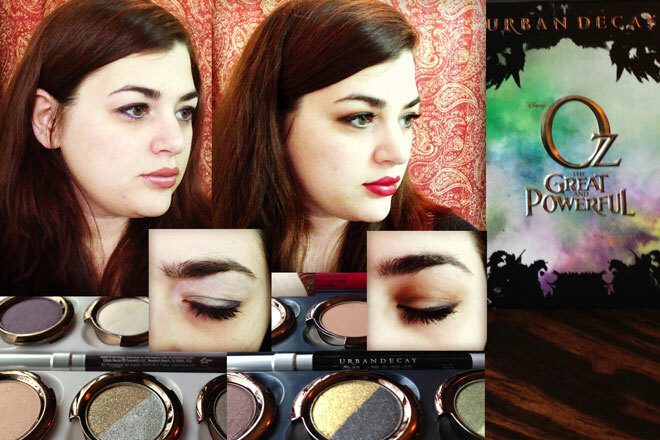 Even better is when makeup intersects with a particularly geeky favorite. 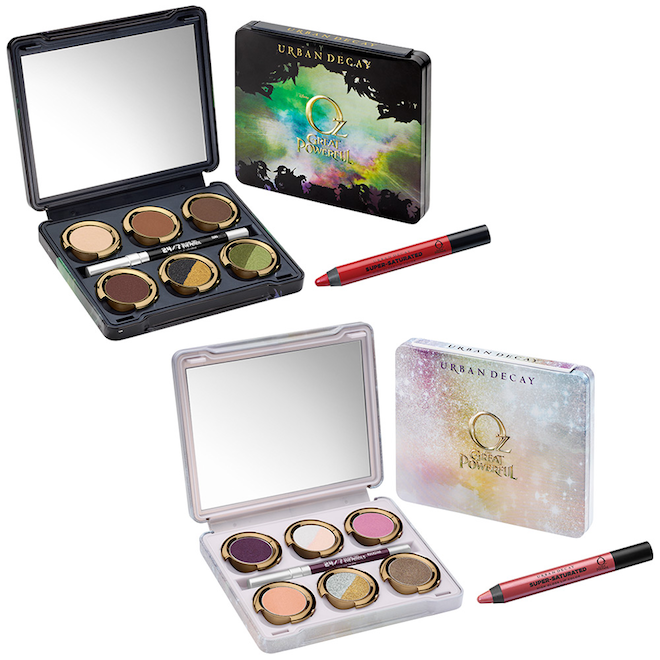 When I saw that Urban Decay, my favorite cosmetics company, was putting out two limited-edition palettes inspired by Disney’s upcoming film Oz: The Great and Powerful I did a little happy dance. I did an even bigger happy dance when the two palettes–one for Theodora and one for Glinda–showed up for review a few days ago. I’ve been an Oz fan since I was a little kid, and while I preferred Return to Oz for its altogether creepiness and sense of the bizarre, the idea that I myself could wear some looks inspired by these famed witches made me happier than Princess Mombi in the Hall of Heads. I stumbled upon Urban Decay by accident at Sephora, about four years ago, while on the lookout for a new eyeshadow palette. I stumbled upon their brightly colored display and immediately felt I was on to something. With eyeshadow names like Midnight Cowboy, Loaded, Oil Slick, Radium, Rockstar, and Half Baked, I knew I wasn’t in my mom’s makeup bin anymore (which is fine, because my Mom’s Mary Kay stash smelled like old wax). It’s the cheekiness that got me first, but the quality that kept me a loyal buyer. I’m an absolute devotee to their eyeshadow primer (I honestly had no idea that you could keep eyeshadow on all day until I found this product) and almost everything I’ve ever tried in their line rocks (save the mascara, but you can’t be perfect, right?). Anyway, I wear Urban Decay almost every day, and I’m particularly fond of their eyeshadow. An artful stroke here and there really can make all the difference in your day, and I have always loved experimenting with their fun colors. While most days I use the Naked 2 set, I still use a variety of their other colors when seeking that extra flair. There are two new sets for the new Oz film, and as I mentioned one is for each witch, Theodora and Glinda respectively. One is darker and more earthy, the other brighter and more ethereal. The packaging is gorgeous (nice, sturdy metal like their Naked series) and uses different versions of the film art, and the colors are smooth and sultry. Some have iridescence, others more matte. Each comes with an eyeliner and lip gloss (which is long-wearing and better than many lipsticks I’ve used). The names of the colors are predictably delightful, including Beware, Spell, Magic, and Jealous. As a bonus, there’s a card in each palette that tells you exactly how to achieve the look from the films (cosplayers, rejoice!). I decided to go ahead and try each look myself, and show you the results (see below). I’m very happy with the end result, even though I expected it to rock. I’m much more akin to Theodora’s coloring, though, so even though the Glinda set looks pretty decent it’s not something I’d wear every day. But the movie look is just the beginning–there are eight shades in each palette (two of each are split in two) so there’s plenty of room for experimentation. Which I will surely do. The eyeliner is creamy and easy to apply, and I’ll be using both colors frequently. Me, having fun with the palettes. Glinda on the left, Theodora on the right. Image by Natania Barron. I always advise adding primer potion before adding the eyeshadow, which I did, but otherwise the look is entirely out of the box. All in all, it’s an ideal gift for the Oz fan in your life, or as a treat to yourself. I can vouch that every penny is worth it. The Glinda and Theordora palettes retail for $49.00 each, and can be found online and at various retailers (like Ulta and Sephora). Buying online does give you their “Love it or Leave it” guarantee, which is pretty sweet. I was provided a pair of palettes for the purpose of this review.